Update: All-Clad has discontinued this item as of 2009, but we recommend the the All-Clad Chef’s Pan as a comparable alternative. Tying on an apron, turning up my music, and spending time in the kitchen cooking and baking – that’s my idea of a relaxing evening. But after work, I’m hungry, so I like to make dishes that don’t take too long and that don’t require a lot of clean up. My ideal meal can be cooked in one dishwasher safe pot or pan. Recently I discovered a pan that I wish I had found years ago. Known for cooking curry, the All-Clad Karahi pan is versatile and small enough to fit on one burner, as opposed to other bowl-shaped pans that monopolize the stove top. 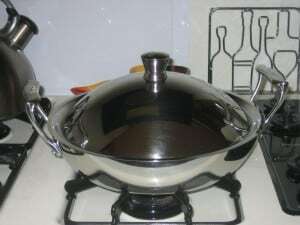 The handles are well-placed, sitting higher than an average pan, and do not grow hot while the pan is on the stove, making it touchable, holdable, and movable without potholders or burning fingers. As to the cooking itself, for my first Karahi pan adventure I stir-fried chicken and broccoli (see this quick and easy recipe below). The stir-fry cooked evenly and nothing stuck to the bottom or sides of the pan. Despite its compact design, I cooked a pound-and-a-half of chicken and two large bunches of broccoli in the pan. It looks small but it cooks large. Like my other All Clad pots and pans, the Karahi is dishwasher safe, which I adore. Update: As of 2010, Marcus Cookware manufacturer Regal Ware USA, has been re-named it American Kitchen Try-ply Cookware. The new line features the same tri-ply construction and continues to be made in the USA. Everyone at MetroKitchen received a sample Marcus Stainless 8″ fry pan from Regalware and to try at home, and received rave reviews! One MetroKitchen employee said, “I tried it. I thought it was great. Heating was even and seemed to work as well as the other high end brands.” I was lucky enough to try the 6 quart covered stock pot, creating sauce and the performance was superior. My sauce heated evenly and quickly and never burned. I found the handles extremely comfortable and transported the pot right to my table. This made in the USA cookware was designed to meet the needs of today’s professional chef. 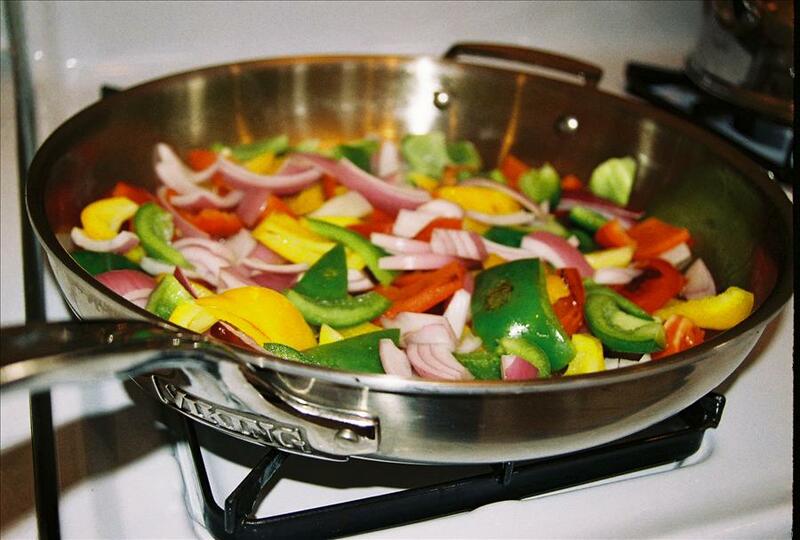 Marcus stainless steel cookware is safe for any cooktop surface, including induction. Additionally, it is oven and broiler safe too! Made in the USA, Marcus Samuelsson cookware can be bought in sets or open stock. Special Offer: MetroKitchen.com is currently selling the Marcus 8-inch fry pan at special “try me” price of $29.95! My family hails from New Orleans, home of fabulous food, especially seafood! So, when aunts & uncles come to visit us in Atlanta, what do they bring? Delicious seafood, of course! When my family came to visit a few weeks ago, they brought some incredible soft-shell crabs…my mom’s favorite. The only problem was, how were we going to fry up 15 soft-shell crabs to feed our huge family? Naturally, with the All-Clad Electric Skillet. We thought of buying the All-Clad Fry Basket to use with our All-Clad 6 quart Stock Pot, however, it would take us too long to fry all those crabs! So, we decided to go with the All-Clad 6 quart Electric Skillet instead. It worked perfectly! We filled the skillet up about ½ way full with canola oil. Once we turned the skillet on, the oil heated up in no time at all. We were able to fry all of them in 2 batches due to the large surface area the skillet offers. The crabs were absolutely delicious! One of the best things about the skillet was that we could plug it in anywhere in the kitchen & it was out of the way of the other things we were cooking in our kitchen. The easy to read temperature control kept the oil evenly heated & brought the oil back up the correct temperature when the crabs were added. There was very little mess even though we were frying in oil. The skillet was deep enough to hold the oil & the crabs & have minimal splattering. The lid also worked wonders & enabled our delicious crabs to get nice & golden brown. 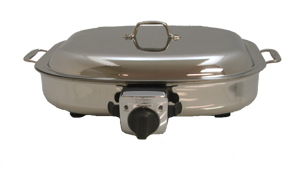 The best thing about the All-Clad Electric Skillet was the clean-up…it was a charm! Once the power cord is detached, the skillet can go right into the dishwasher for the easiest clean-up ever! It definitely beats attempting to clean those old pesky deep fat fryers! I highly recommend this skillet to anyone looking to fry yummy seafood like I did, or if you want a classy way to cook eggs for a house full of out of town guests! You’ll definitely do it in style with this All-Clad Electric Skillet! It was exciting to get to use some new MetroKitchen.com wine brands. First are the Riedel wine glasses in the new Riedel Tyrol style. We looked at and tried the “O” stemless glasses but didn’t think they felt special enough for wine. Plus, given my gracefulness, I was concerned I would too easily dump wine on my dining partner, not to mention shatter the glass. are appealing because they’re a bit taller. We like to feel like having a glass of wine is special, even if we’re not celebrating anything and the bottle was under $10! The other great MetroKitchen.com brand that we used this weekend was the Pek Wine Preservation system. 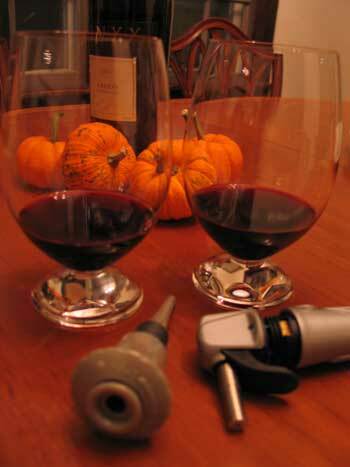 The Preservino will preserve the remains of your bottle of wine for up to 2 weeks! That’s because this system uses the same type of gas that California vintners use to preserve their top quality wine. It uses argon gas, which does not change the flavor of the wine because it is inert. We used the “starter” kit with 1 argon cartridge and dispenser and two stoppers. The Pek Preservation products also include units that chill and preserve. I was recently passed the “torch” to try out in my own kitchen. What is the “torch” you ask? Well it’s the new Viking Hand Blender, of course! It actually does resemble Miss Liberty’s “torch”, and it also gives new meaning to the word “freedom” in the kitchen, just as the “torch” exemplifies freedom to Americans. The Viking Hand Blender provides you with the ability to work anywhere in your kitchen, from your stove, to your counter top to your wine bar. My mission was to create a desert smoothie without having to use a full-size blender, since I was just making a smoothie for two. One of the many great benefits of using the Viking Hand Blender is that it’s just the right size when creating smaller amounts of foods. Yet, at the same time, if you are cooking a butternut squash soup on the stove for a party of 8, the hand blender by Viking provides you with the convenience of blending the soup right on the stove in your pot. Strawberries, raspberries, blueberries and black berries, some crushed ice, mixed with non-fat vanilla yogurt and a dab of Cool Whip, was all it took to create a deliciously, creamy smoothie. The fact that all I had to do was place the ingredients in the 35 ounce mixing cup that came with the blender, and then immerse the blender into the yogurt mixture and lightly touch the speed button (I chose speed 1-the lower speed), and watch the Viking Hand Blender do its magic for literally 2-3 minutes, was amazing. I couldn’t get over how lightweight the actual blender was, and the ergonomic no slip grip provided great stability. Clean up was also a breeze, I chose to hand wash everything with mild soap and water. I never had to worry about bending down, pulling out my blender from the cabinet below and besides, cleaning a full size blender is never fun. 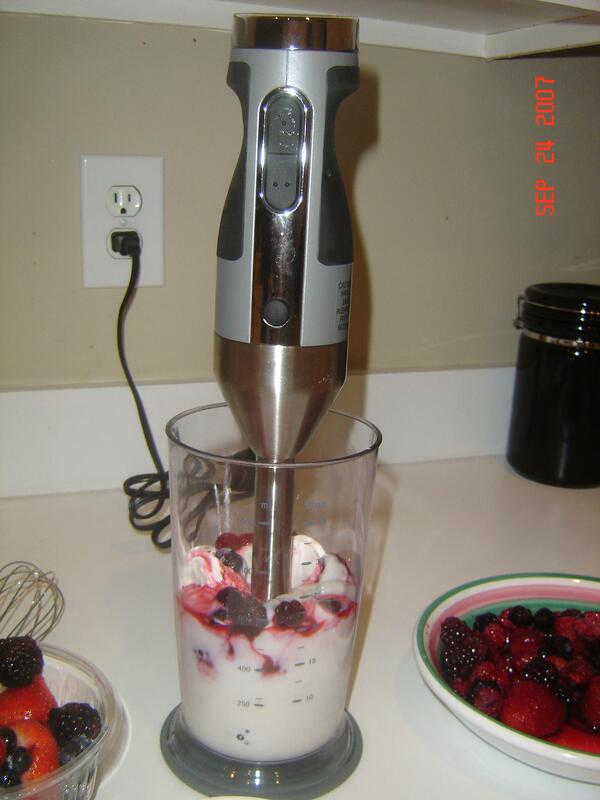 Viking’s new Hand Blender is a great tool for the kitchen. You can store it easily or display it on your counter. You can also buy a separate chopper attachment as well. This product would also make a great gift, as it’s a multifunctional kitchen tool at a relatively low price. Create drinks at the bar, soups on the stove, or blend cake batter on your counter top, all with one tool. Fall is here. For some that means its football season, for others, it’s a signal to kick-start holiday shopping, but for me, it means less grilling and more indoor cooking! I’m so excited to start “cooking” all those feel-good, comfort meals again, and my family is ready to move on from turkey burgers, hot dogs and kielbasa, my staples from this past summer. I’ve been looking forward to trying my Viking fry pan; so I decided over Labor Day Weekend, I would incorporate cooking into our Labor Day holiday bbq. A favorite meal among my family and friends is sausage and peppers. The decision was we would grill the sausage, and I would sauté the sausage and peppers. I tweaked my mother-in-law’s recipe, and it seems to be a hit every time. See the Italian Sausage and Peppers Recipe below.